Bagrada bug has an interesting scientific name - Bagrada hilaris. This bug is native to Africa and the genus probably represents the ancient Bagradas River in North Africa. Species name ‘hilaris' means cheerful, merry or joyful in Latin. Although such feelings are not associated with this pest considering its damage to cole crops in agricultural fields and home gardens, it probably refers to the pretty color pattern of the insect. As the spring season approaches, yellow patches of wild mustard brighten the landscapes and blooms of alyssum whiten the gardens. Both are favorite hosts of the invasive Bagrada bug which has moved as far up as Monterey County. 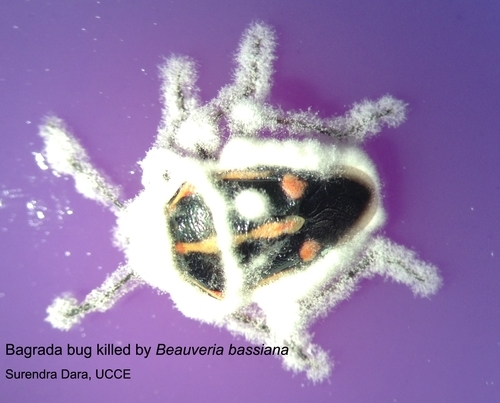 Growers and gardeners should be on the lookout for the Bagrada bug which mainly feeds on cole crops and other hosts such as alyssum and wild mustard. Bagrada bug females deposit barrel-shaped whitish eggs on the foliage and in the soil in clusters. Eggs hatch and nymphs go through five instar stages before becoming adults. Early instar nymphs have black and orange coloration and the late instars and adults have black, orange, and white patterns. Females are larger than males. Correct identification is important in handling any pest as the control strategies can vary for different pests. 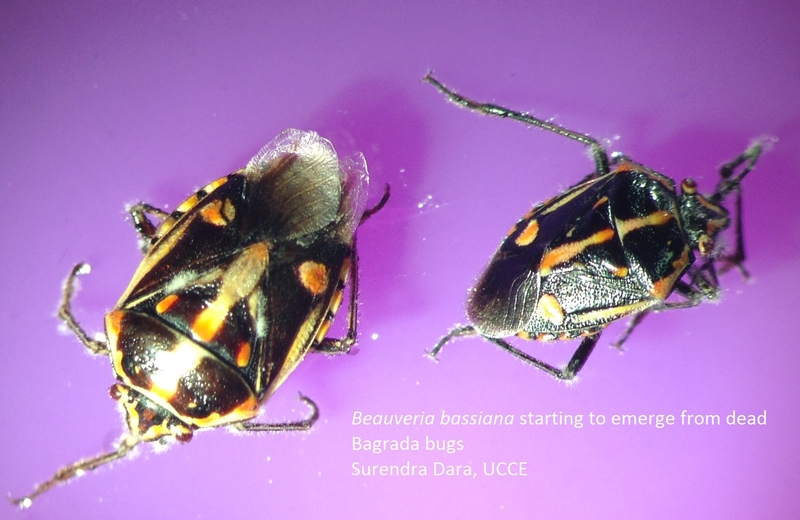 Some sources incorrectly refer Bagrada bug as a synonym of harlequin bug. They look similar, but they belong to two different genera and are of different sizes. 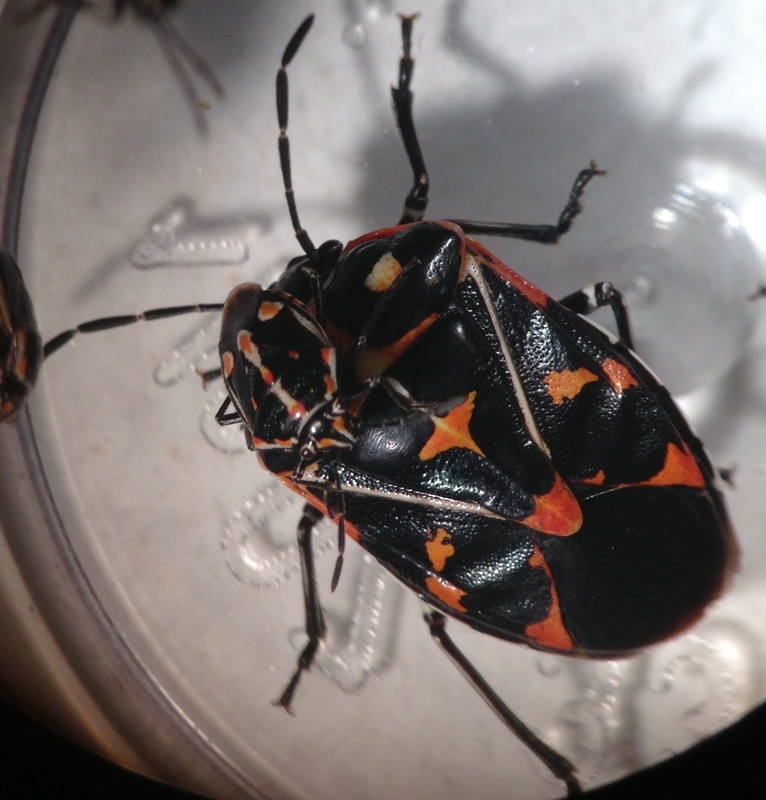 The adult harlequin bug [Murgantia histrionica (Hahn)] is probably 6-8 times as big as the Bagrada bug adult. 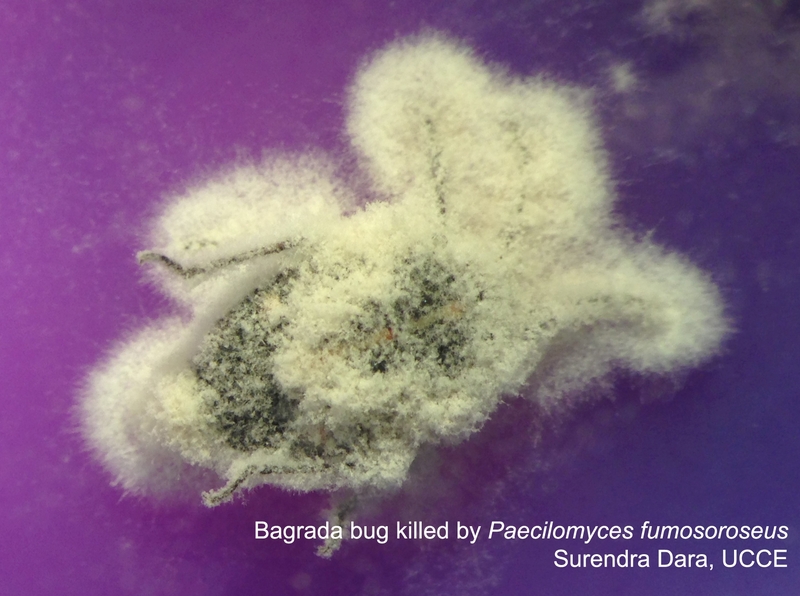 Organic control options: Preliminary data from my multiple laboratory assays indicate that commercial formulations of three entomopathogenic fungi, Beauveria bassiana (strain GHA), Metarhizium anisopliae (strain F52), and Paecilomyces fumosoroseus (strain FE9901) caused good mortality or infection in Bagrada bug adults. Additional assays will be conducted before publishing the data. 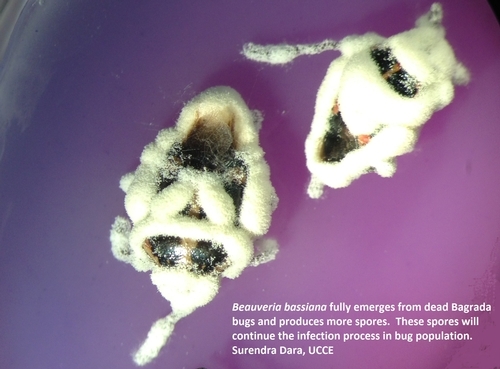 Bagrada bug adults infected and killed by commercially available formulations of three insect pathogenic fungi. 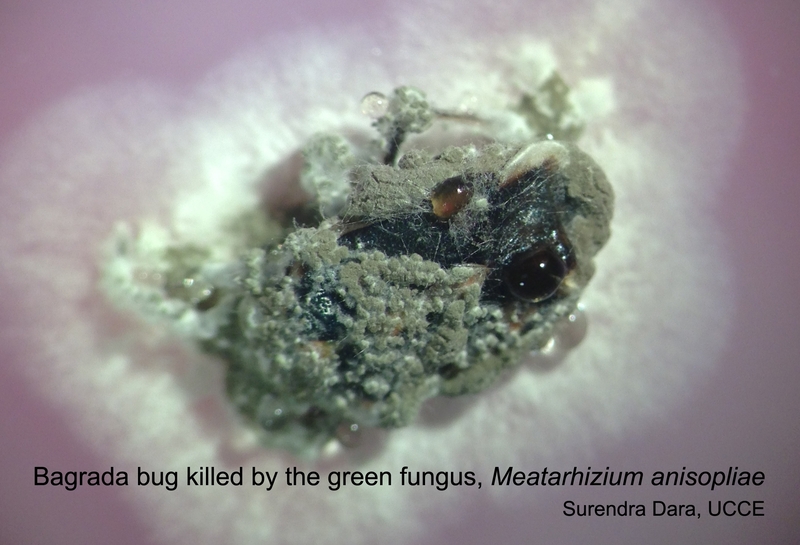 Fungal spores penetrate the insect, spread through the body, kill the insect, and emerge from the cadaver producing more spores. Beauveria bassiana emerges from the recently killed Bagrada bugs (above). White hyphal growth can be seen on the thorax, legs, and other body parts. Fungus continues to emerge from the cadavers, grow, and produces spores (below, four days after the above). Can't wait to find out the results of these experiments. We have this awful pests and would like to know how to control it in our garden. So, Surendra, can you give us a little color on what this thing is going to do in berries? Seems like with its affinity for mustard the populations would move around like lygus, handing growers a second bug challenge during the summer months. While this pest prefers cruciferous hosts for feeding, development, and reproduction, it can feed on a variety of other hosts. I haven't seen them on strawberries or caneberries, but they are capable of feeding on them if they run into these hosts or don't have their preferred food sources near by. Last year, someone sent me photos of Bagrada bugs in strawberries (you can see in my earlier blog). So, it is always good to keep an eye out for them in berries.